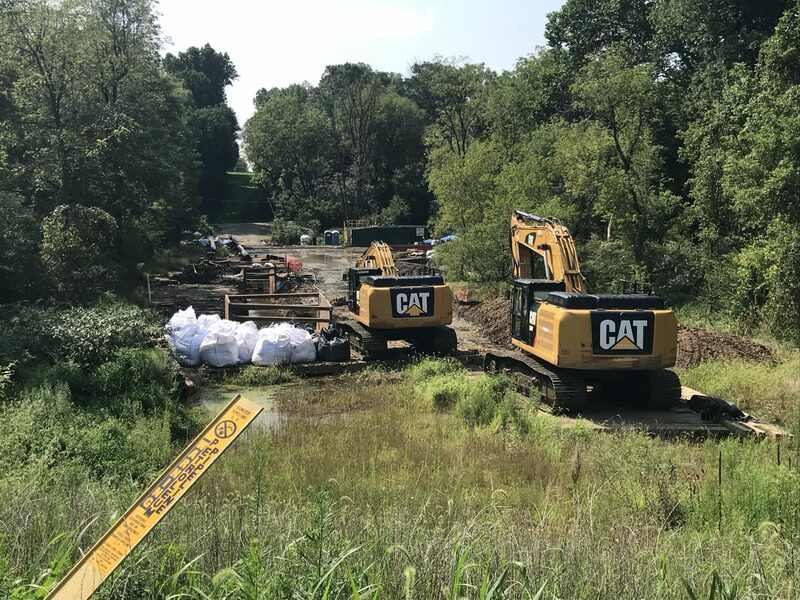 Energy Transfer, the parent company of Mariner East 2 pipeline builder, Sunoco, works at Snitz Creek in West Cornwall Township, Lebanon County after a drilling mud spill during the summer. The map shows the Mariner East 2 pipeline’s path across 17 Pennsylvania counties on its way to the Marcus Hook industrial complex in Delaware County, where the natural gas liquids it carries will be shipped overseas to make plastics. The map was built using state Department of Environmental Protection shapefiles of the route for which DEP issued permits. The line extends west into Ohio. As Sunoco nears the planned opening of its Mariner East 2 pipeline across Pennsylvania, opponents say the company’s nationwide construction record over more than a decade heightens concerns about the safety of the natural gas liquids line. The company’s claims that the multibillion-dollar project will boost the state’s economy and help to bring abundant Marcellus Shale reserves to market are being overshadowed by a long and continuing series of spills and sanctions during the 20 months it has been under construction. Critics of the project say Sunoco has paid little heed to the fines and shutdowns handed out by Pennsylvania regulators. They note that the company has continued to spill drilling fluid into waterways, prompting the Department of Environmental Protection to issue dozens of violations, as recently as Sept. 18, despite the agency’s $12.6 million penalty and permit suspension earlier this year for what it called “egregious” violations. The experience in Pennsylvania mirrors Sunoco’s record in many other pipeline projects, opponents say. That’s reflected in federal data showing the company has the pipeline industry’s second-highest number of incidents self-reported to federal inspectors over the last 12 years, and the fourth-largest number of federal enforcement actions. Data from the Pipeline and Hazardous Materials Safety Administration show Sunoco Pipeline reported 302 incidents from its pipelines carrying hazardous liquids such as crude oil or petroleum products nationwide from 2006 to 2018, year-to-date. That was the second-most among 2,152 operators in the agency’s database after Enterprise Crude Pipeline, a carrier of crude oil, which reported 306 incidents. Sunoco also had 175 federal inspections and 37 enforcement actions during the period. Sunoco’s incidents spilled 28,566 barrels, or almost 1.2 million gallons, over the 12-year period. A little less than half was recovered. The latest Pennsylvania incident recorded by PHMSA is a 33,000-gallon spill of gasoline from an 81-year-old, 12-inch pipeline on June 26, 2018 at Darby Creek near Philadelphia International Airport. The pipeline, which has leaked at least twice before, will be used temporarily to carry natural gas liquids along parts of the Mariner East 2 route in Delaware and Chester counties while the new pipeline is being completed. Sunoco says its deployment of the old line will enable it to start delivering NGLs to customers whose orders have been deferred by repeated delays in the line’s construction. Among other large energy companies, Shell Pipeline reported 114 incidents to PHMSA and was the target of 14 federal enforcement actions during the period, while Phillips 66 reported 212 incidents and saw 56 enforcement actions, the data show. Sunoco’s incident total rises by five if incidents reported by the now-defunct Sunoco Inc. are added. Pipeline operators are required to report incidents to PHMSA if they involve fatalities or injuries; result in releases of five barrels or more of highly volatile liquids, or 50 barrels for other liquids; lead to costs totaling at least $50,000; or lead to a fire or explosion. Lisa Dillinger, a spokeswoman for Sunoco’s parent, Energy Transfer Partners, said 86 percent of spills between 2010 and 2018 were less than 50 barrels, and about three-quarters of those were of less than five barrrels. In 2017, 95 percent of incidents were on ETP property, a similar rate to the period from 2002 to 2017, she said. In the last three years, ETP has reduced its accident rate per 1,000 miles by 30 percent, aligning it with an industry average, Dillinger said. She added that since Sunoco Pipeline’s integration with ETP on May 1, 2017, accidents have been “drastically reduced,” and that the company spent $429 million on assets in 2017. “It is our priority to maintain and operate our assets to the highest safety standards, not just because it makes good business sense, but because it is the right thing to do,” she said. A former PHMSA administrator said the agency’s data do not necessarily show a pattern of negligence by an operator. Brigham McCown said an incident may be reported because of a release of as little as five barrels, and may not reflect whether an operator or another party was responsible for an incident. “Incidents do not translate into negligence or responsibility on the part of the operator,” said McCown, who is now chairman of the Alliance for Innovation and Infrastructure, a research and advocacy nonprofit. Eric Friedman of the community group Del-Chesco United for Pipeline Safety said McCown’s comments reflect an industry-friendly position that downplays or ignores safety risks, and misrepresents the data. McCown’s assertion that one of the “leading causes” of pipeline damage is third parties rather than the operators is at odds with PHMSA data showing that third-party excavation was responsible for only 5.9 percent of accidents in 2017, compared with 75 percent for the operators themselves, Friedman said. “I’d rate McCown’s statement as misleading at best, false at worst,” he said. But Rick Kuprewicz, an independent pipeline consultant, also said PHMSA’s incident tally may not be numerically accurate because it relies on self-reporting by the operators, and so may under-count incidents. “There are some companies where their self-interest is: ‘Why should I volunteer information? '” he said. Still, the numbers can be used as a general guide to the volume of incidents reported by a company, and any enforcement actions that follow, he said. Despite its flaws, the PHMSA data is the only source that the public can use to get an overall view on the number of incidents reported by operators, Kuprewicz said. Sunoco says it plans to begin operating Mariner East 2 by the end of September. When up and running, it will carry propane, ethane and butane from the Marcellus Shale of western Pennsylvania and Ohio to a terminal at Marcus Hook in Delaware County where most of it will be exported to Scotland for plastics manufacturing. Aside from the PHMSA data, critics cite incidents that feed their fears about the safety of Mariner East 2. 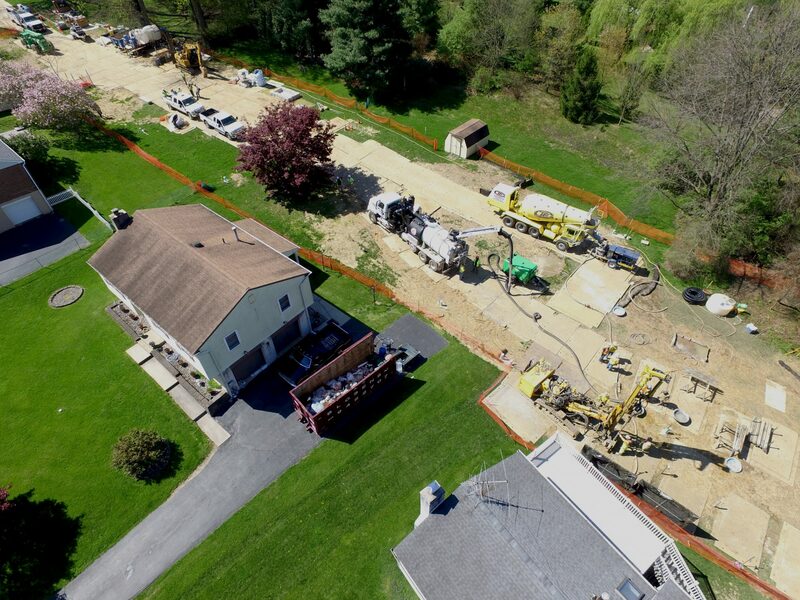 In May, a water contractor excavating near an elementary school at Middletown, Delaware County struck Mariner East 2 at a depth of 6.2 feet, almost three feet shallower than the nine feet Sunoco had stated. The damage was minor but the incident prompted critics to warn that it could have resulted in an explosion if the line had been operational at the time. The Middletown incident raised questions about whether Sunoco had given inaccurate information about pipeline depth elsewhere along the 350-mile line across Pennsylvania. The incident is being investigated by the Public Utility Commission; by PA OneCall, a nonprofit that provides information to contractors about underground infrastructure; and by Sunoco itself. None of the parties has announced results. Safety concerns arose again in August when Sunoco confirmed it dug up and replaced a section of Mariner East 2 in Edgmont Township, Delaware County because of unspecified flaws in the coating. The chances and consequences of a leak or explosion from the Mariner East lines were examined by Quest, an independent consultant, which was hired by Del-Chesco United for Pipeline Safety, a community group in Delaware and Chester Counties, to assess the risk of living near the pipelines. In a draft report released on Aug. 28, the company concluded that the chance of being killed by such an incident was about one-tenth that of dying in a car crash and even less likely than dying from heart disease. Mariner East 2 pipeline construction crews work in the backyards of homes on Lisa Drive in West Whiteland Township, Chester County, on May 2. Sinkholes that opened in the area prompted the state’s Public Utility Commission to order that an existing pipeline nearby, the Mariner East 1, be shut down until it could be determined that the sinkholes didn’t threaten its safety. PUC on May 3 approved a re-start of Mariner East 1. Still, pipeline safety advocates said the report underlined the risks of pumping highly volatile liquids through densely populated areas like Philadelphia’s western suburbs, and shows that state government has allowed the project to go forward without full scrutiny by state regulators. Mark Nicastre, a spokesman for Wolf, said the DEP and the PUC have required Sunoco to comply with rigorous standards during the construction. Cost: More than $2.5 billion. The company has not disclosed an updated cost. Length: 350 miles from Scio, Ohio to the Marcus Hook industrial complex in Delaware County, Pa. It runs along the same right-of-way used by Mariner East 1, a repurposed line that is carrying natural gas liquids to Marcus Hook, and Sunoco’s next project, Mariner East 2X. Economic impact: Potentially $9 billion in from construction and other activity between 2014-2019, according to a study paid for by ETP. Of note: The Pennsylvania Department of Environmental Protection’s website lists 78 notices of violation through Sept. 14 for inadvertent returns during ME2 construction. In January, the DEP shut down work on the pipeline, citing permit violations; it later allowed work to re-start but penalized the company $12.6 million. In May, an administrative law judge stopped work on the pipeline in parts of West Whiteland Township, Chester County, citing a risk to public safety. PUC allowed work to resume in August after Sunoco had met necessary conditions. What it carries: Natural gas liquids from Marcellus Shale fields in Ohio and western Pennsylvania. Mariner East 2 is part of a three-stage project: Mariner East 1 involved reversing the flow of an existing line; the company has plans to build Mariner East 2x. All three lines will run along the same right of way. Where they’re going: The natural gas liquids are being shipped overseas to make plastics. What are natural gas liquids, and what happens if they leak?